If you’ve ever been on pinterest for more than a few minutes, you’ve probably seen at least one of the dozens of overnight oats recipes that are so gosh darn popular there. They all sound super tasty and the pictures make them look really fantastic. Needless to say, seeing them over and over again made me super curious. When I finally got around to trying my hand at overnight oats, I found that none of the 4 or 5 recipes I looked at had all the elements I wanted and some of them required ingredients I either can’t eat (mangos, gluten, etc) or I didn’t have on hand. So I combined elements from each and made up my own. 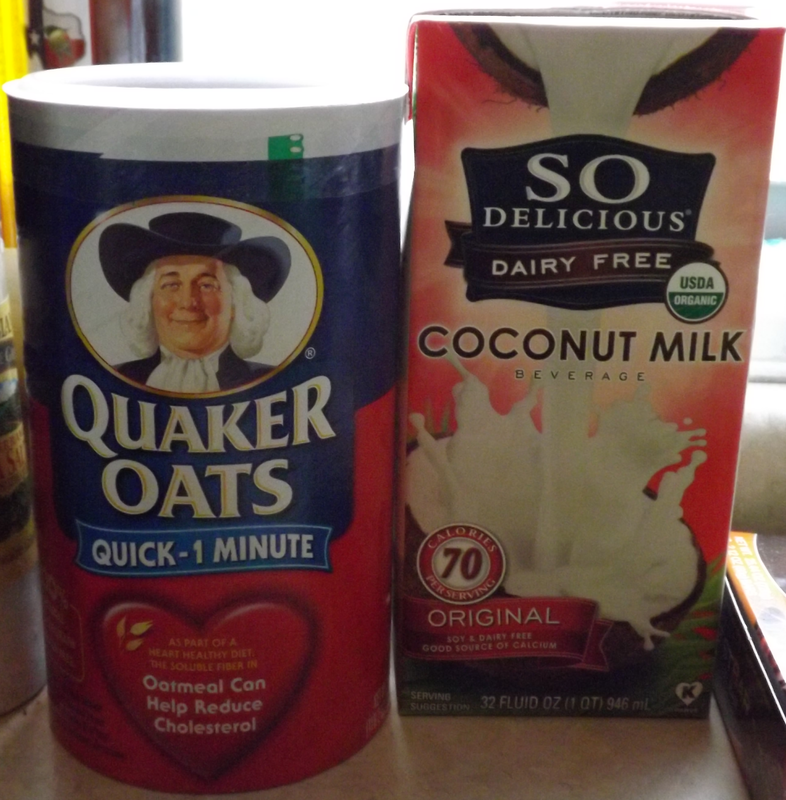 For me, the main ingredients included Quaker quick oats and coconut milk. I know that many of the recipes require soy or almond milk and greek yogurt, but I don’t drink soy milk and I had neither greek yogurt or almond milk on hand. Thankfully, coconut milk has a thicker consistency than it’s other non-dairy friends, so it worked out nicely. 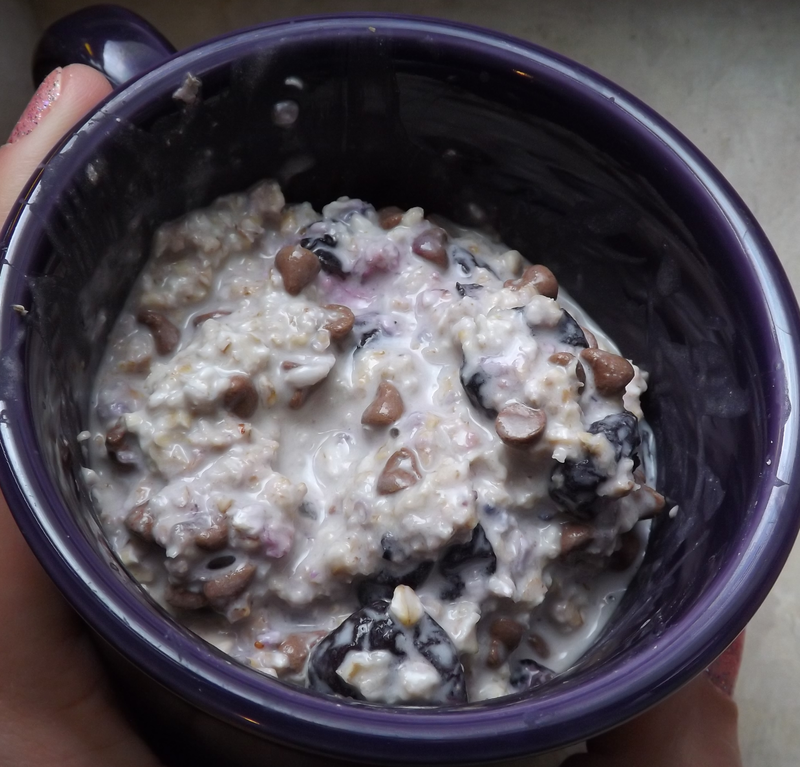 The recipes also want you to use rolled oats, but quick oats is what I had and they worked beautifully so I see no problem. The main ingredients to both of my recipes. The first night, I assembled my main ingredients and went looking for fruits and the like. Several of the recipes I came across had bananas and blueberries in them. I knew I had both on hand, so that’s what I went with for my first night. The second night, I wanted to try something a little funkier and maybe add some chocolate to the mix. I knew I had a bag of mini semi-sweet chocolate chips on hand and was sure to put them to good use. Add blueberries and sliced banana to a small mixing bowl. Smash together with wooden sppon. Add oats and coconut milk. Stir well. Sprinkle with cinnamon and stir well. Cover with cling wrap and refrigerate overnight. Makes 2 to 3 servings. Add blueberries to small mixing bowl and smash with wooden spoon. Add in chocolate chips. Stir well. It’s worth noting that, because they are sitting in the mixture overnight, the chocolate chips will lighten in color. Don’t let this worry you. It’s what naturally happens. Yum, these recipes look AMAZING!